At the Penn Museum, you can leave 18th century Philadelphia behind for far more ancient history. This Sphinx is the third-largest ever uncovered, from Memphis in Egypt, and is on display in the Lower Egyptian Gallery, at the University of Pennsylvania Archaeology and Anthropology Museum. To fully appreciate the Sphinx, just click directly on the photo to enlarge it. The University of Pennsylvania’s Museum of Archaeology and Anthropology - referred to generally as the Penn Museum - is often overlooked by visitors, due to its location in University City – very far from the historic places to visit in Philadelphia. But its collections offer the visitor the chance to walk through various millennia, and cherish its antiquities and treasures – the result of more than 400 archaeological expeditions, worldwide. When you arrive at the main entrance, you are greeted with an incredibly beautiful and tranquil courtyard, with a fountain in the center. It sets the stage for your entry into past civilizations. We spent most of our visit in Iraq's Ancient Past: Rediscovering Ur's Royal Cemetery. This is probably the best section of the Penn Museum, but regrettably, it is closing for renovation as of July 21, 2010, and not reopening until March 2011. That having been said, it is spectacular. It does a superb job of contextualizing the finds for visitors. Obviously, Iraq's tumultuous 20th and 21st century history - which continues on a daily basis - is what is best known to contemporary Americans, but the region is home to an incredible number of priceless antiquities. When you tour Iraq's Ancient Past, many of the objects date from around 2500 BC - that is, 2500 years before Christ, and 4500 years from the present day! Whereas the nation known as "Iraq" has only existed since the early 20th century, a mere blip in the history of the "cradle of civilization". One could easily spend the afternoon just in that one exhibit. The cast of British characters who excavated Ur in the 1920s and 1930s is also highly colorful. Among others, T.E. Lawrence - the British officer whose World War I exploits led to the iconic Academy Award-winning film Lawrence of Arabia - and renowned mystery writer Dame Agatha Christie were involved in the excavation. Coming on the heels of the King Tut excavation several years earlier, the team led by the distinguished archaeologist Robert Wooley made world headlines with an excavation that was even larger than the King Tut find. As the exhibit explains, the treasures were divided between the British Museum in London and the Penn Museum in America. However, while you're waiting for Iraq's Ancient Past to reopen, the Penn Museum has plenty of other exhibitions to keep you occupied. One temporary exhibit, which is geared to Philadelphia history, is Fulfilling a Prophecy: The Past and Present of the Lenape in Pennsylvania. However, some of the permanent exhibitions are breathtaking. The Chinese Rotunda is 90 feet in both diameter and height - one of the largest unsupported rotundas of any kind in America, and it contains one of the best collections of monumental Chinese art anywhere in America. When you walk into it, you are amazed. 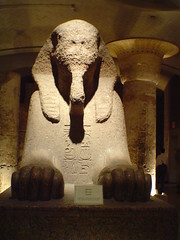 The Lower Egyptian Gallery is the home of the Sphinx which you see in the photograph at the top of this page. Weighing 12 tons and made of red granite, it was originally quarried at Aswan, near the southern border of Egypt. In an astounding feat of ancient engineering, they managed to transport the gargantuan statue around 600 miles, via the Nile River, to Memphis in Lower Egypt. For most of its history, it was buried in Egyptian sand up to the shoulders - this is why its face has been eroded over the millennia, but the rest remains intact. It's worth a trip to the Penn Museum just to see the Sphinx - the third-largest in the world - but the rest of the Gallery is exceptionally cool. It is a fantastic effort to display as much as possible, an excavated royal palace of the relatively-recent New Kingdom Pharaoh Merenptah, who reigned for about a decade, around 1213-1204 BC - in other words, about 1300 years after the treasures you can see in Iraq's Ancient Past, once it reopens in March. Merenptah's excavated palace display is the finest attempt of an exhibit of an Egyptian royal palace, in any museum in the world. Worlds Intertwined: Greeks, Romans, and Etruscans offers the visitor a chance to see the underlying foundations of Western Civilization. The eclectic collection from all three civilizations is a marvel to behold and could occupy you all day. A particularly interesting display in the Roman World Section, is a display with a coin minted in the likeness of many Roman emperors, listed helpfully in chronological order. And what you're reading above is only a part of what the Penn Museum has to offer. Other exhibits include the African, Islamic, and Mesoamerican Galleries. However, the Museum is undergoing major renovations, in its 19th century building, and some galleries and exhibits are temporarily closed, as a result. The building is getting a major renovation done, and the evidence is all around you. But it doesn't detract from your enjoyment of the Museum's exhibits, which feel like a whirlwind tour of the world, and of millennia. However, here is one important tip, if you're visiting in the summer months: due to the age of the building, not all of the galleries and exhibits in the Penn Museum are air-conditioned. Aptly, the Egyptian galleries are among the ones which are not - and the same is true of the Chinese Rotunda. Closed Mondays, holidays, and Sundays during Memorial Day and Labor Day weekend. Admission - as the Penn Museum puts it - "Suggested Museum Admission Donation"
On Tuesday through Saturday afternoons, starting at 3:30 PM, "pay what you want" - as well at 4 PM on Sunday. As a general rule, we would recommend taking one of the many SEPTA options, particularly if you are from out of town. If you are already in the city, you can take the Blue Line / Market-Frankford Line / "the el" - which are all different names for the same thing - and exit at 34th Street Station. You will disembark at 34th and Market, and the Penn Museum is at 3260 South Street, just a few blocks away. In addition, SEPTA Bus Routes 21, 30, 40, and 42 all take passengers near the Penn Museum. You can also use SEPTA Regional Rail service to the Penn Museum. There is a SEPTA Regional Rail stop at University City, which puts you - literally - a block away from the building. However, not every SEPTA Regional Rail train stops there, so make sure that before you get on, that you ask the conductor, if it's going to University City! However, nearly every SEPTA Regional Rail train will stop at 30th Street Station - located at 30th and Market Streets. From there, it's only a few blocks' walk, or you can take a cab, to the Penn Museum. If you'd like to leave the Penn Museum, and return to the Philadelphia Museums Main Page, please click here.